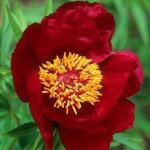 They tease us with new shoots of vivid scarlet, as if to pre-warn us that they’re something far from ordinary – and peonies certainly are. 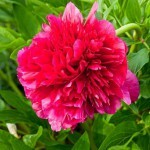 Sumptuous, billowing, ruffled, luxurious – just some of the terms applied to the flowers of these striking plants. 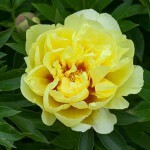 Bear in mind that there are two types – shrubby forms and herbaceous perennials. The former have an open, lax habit and benefit from minimal pruning – simply remove any frost-damaged growth in spring. 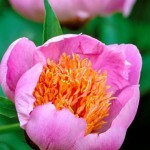 Position them in a sheltered spot and not only will this deter breakages, it will allow you to enjoy the heady perfume of fragrant types such as Paeonia ‘Souvenir de Maxime Cornu’, or the huge 30cm-diameter flowers of P. rockii. 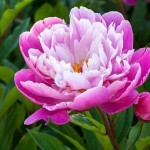 Herbaceous peonies are equally special. As any bride will tell you, they command a high price for bouquets due to their luxurious status. Here, you can find some magnificent fully double types like the delicate pink ‘Sarah Bernhardt’ which looks like a scoop of raspberry ripple ice cream while in bud, and the in-your-face ‘Rubra Plena’ which shouts out for attention in any border. 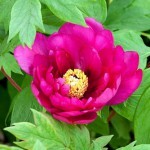 The key with these plants is not to plant them too deeply – do so and you’ll be disappointed by a lack of flowers. Position the crowns in full sun or part shade, and you’ll be rewarded with opulent blooms for decades. 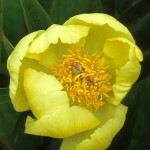 This entry was posted in Plant focus on June 29, 2015 by gapadmin. Lush, zesty, emerald, verdant – there are infinite ways to describe the most prominent colour in our gardens and an equal number of techniques to apply it, too. Creating a tapestry of green is an underrated and often refreshing way to look at plant combination and design. By focusing on this single colour, you observe plants in a different light. No longer are you drawn by punchy reds and lustrous purples – your eye instead is attracted to architectural foliage playing with light and shadow, subtle undertones of steely blue sitting next to diffused burgundy, and blocks of universal colour versus multi-tonal variegation. Very few plants flower for more than three months of the year, so once those prima donna blooms have faded from the limelight it makes sense to ensure you’re not left high and dry by checking out the supporting act they’ve left in their wake. 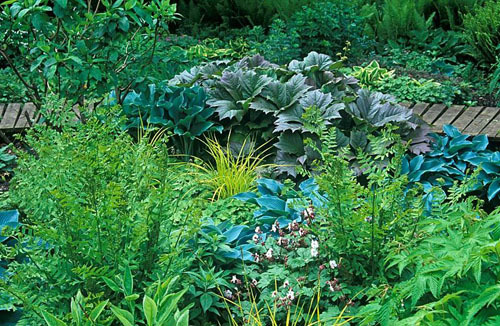 The glaucous foliage of hostas, cardoons, verbascums and stachys break up rich green hummocks of cranesbill geraniums, phlox, monardas and delphiniums. The strap-like foliage of day lilies, agapanthus and kniphofias add vertical accent that draws your eye among alchemilla, heleniums and violas. And who could fail to feel spring-like while gazing upon vivid lime green splashes of shuttlecock ferns, euphorbias or Physocarpus ‘Dart’s Gold’? Green is just waiting to be explored. 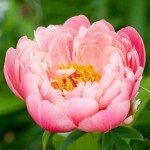 This entry was posted in Planting combinations on June 25, 2015 by gapadmin. When Laura and Jack Willgoss met as horticultural trainees at RHS Wisley back in 2006, they didn’t think they’d be winning gold medals at the prestigious RHS Malvern Spring Show. The couple, now married, dreamt of owning a specialist plant nursery and beautiful garden, and that dream has virtually been realised. The walled garden at Millichope Park is still being transformed, but the two now run Wildegoose Nursery in Shropshire and attend a series of gardening shows around the country annually from spring till autumn. This year is an especially exciting one for them. Spurred on by their Malvern success, the couple will be exhibiting at the RHS Chelsea Flower Show and have been busy propagating, pinching out plants and moving them in and out of polytunnels to encourage peak performance come late May. Rather than sell a large range of plants, Laura and Jack have chosen to specialise in violas, and now offer over 180 different varieties. They were first attracted to these diminutive perennials on a visit to a local nursery. Though it sold all manner of perennials, their spring trip revealed an impressive display of violas with smiling faces and a cheery disposition. 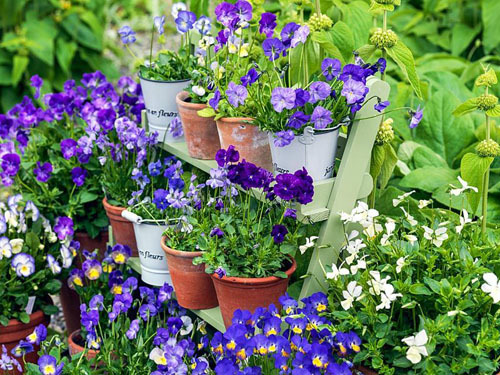 The couple avidly began collecting varieties – specifically hardy, perennial varieties of Viola cornuta and other viola hybrids – initially from this nursery, and then from Bouts Cottage Nursery. This was home to an impressive collection put together by Mark and Stephanie Roberts. Since 1978, the couple had dedicated their lives to ‘all things Viola’, preserving rare and endangered varieties as well as introducing many new ones. Mark and Stephanie retired in August 2011, and Laura and Jack were delighted to be asked to become custodians of this precious collection. The couple are keen to add to it with new selections of their own. ‘Violas are very promiscuous, and are constantly cross-pollinating, so we’re always on the look-out for chance seedlings,’ says Laura. Hardy violas make excellent companions for other cottage garden favourites such as geraniums, scabious and astrantias. They naturally form dense mats of ground cover and so have frequently been used as an under storey for roses and other summer-flowering shrubs. Laura and Jack are also experimenting with more contemporary combinations with short grasses such as Hordeum jubatum and Stipa tenuissima. Having evolved as a meadow plant, Viola cornuta grows short stems to hold its flowers above the grass. 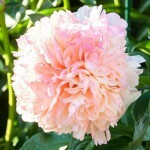 It can begin flowering from March and, with proper treatment, continue right through until September. With varying parentage, the flower colour can vary enormously and be displayed in a range of speckles, stripes and bicolours. The blooms are edible, and so Jack and Laura often combine their plants in vintage or terracotta pots with salad leaves and culinary herbs. As well as being useful for decorating salads, the flowers can be crystallised to be sprinkled on top of cakes, or frozen into ice cubes for summer drinks. Many selections are scented – generally this is reminiscent of honey, though hints of vanilla, clove and even citrus can also appear. The plants take well to growing in containers, making them popular choices for those of us with smaller gardens. To view all the pictures in this feature, click here. Pot cultivation is the simplest method: ensure your container is large enough to keep the roots consistently cool and moist. Use a loam-based compost with extra grit added to ensure sharp drainage. Both sandy and clay plots can be tolerated provided ample organic matter is added to the soil. Any light level is acceptable, except deep shade. Feed plants with a balanced liquid feed at the beginning of the season and then, as summer emerges, with a high-potash formulation, to encourage maximum flowering. 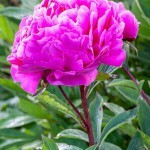 Trim plants back in mid June, once blooms naturally begin to fade, then water and feed well. Within two weeks they will be back in flower. 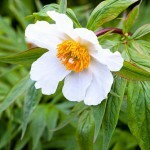 Cut back in early autumn, too, as this ensures compact plants the following spring. 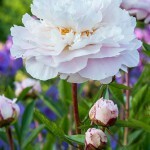 This entry was posted in My favourite, Plant focus on June 22, 2015 by gapadmin.